strong>E Ala E was Israel’s third solo recording, released in 1995. 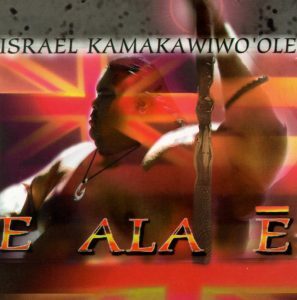 Several of the songs on this album are slightly political in nature, as IZ became the voice for his people and a champion of his Hawaiian culture. There are also lighter Hawaiian ballads, and E Ala E even features a reunited duet with his deceased brother Skippy, thanks to studio technology. IZ was motivated to carry on Skippy’s mission of perpetuating the spirit of the sovereignty movement, and the title track “E Ala E” became the anthem of solidarity among the Hawaiian people. There is also a whimsical side of IZ captured on this album with “Theme from Gilligan’s Island”. Perhaps the final track “A Hawaiian Like Me” says it all: there will never be another Hawaiian like IZ.